Hekla is one of Iceland’s most active volcanoes. Scientists hope to use a network of seismometers to peer into the belly of the mountain and warn of an impending eruption. Connecting this network calls for an especially tough cable from LAPP, as the environment in the mountains of Iceland is anything but friendly. Volcanoes are just as much a part of Iceland as geysers, elves and trolls. One of the most active and dangerous of these is Hekla, located in the south of the island. It erupts approximately every ten years, most recently in 1970, 1980, 1991 and 2000, spewing fountains of ash up to 30 kilometres into the sky. But since the last eruption in 2000, the volcano appears to have been on a break. This is good news for tourists, who have come in their droves to hike to the crater rim 1,491 metres above sea level. But this makes geophysicists nervous. “Hekla could erupt at any minute”, warns Martin Möllhoff, “and the longer this quiet period goes on, the more violent the eruption will be”. The German geophysicist works at the School of Cosmic Physics of the Institute for Advanced Studies in Dublin, Ireland. Here, he leads the technical division that uses seismometers to monitor countless volcanoes around the world, including Hekla. If these probes detect minor tremors in the ground, it is red alert. This is because the last eruptions were only detected in seismic measurement curves around 30 to 80 minutes in advance. As a result, all visitors to Hekla must download an app to their smartphone that receives warning messages via SMS. Möllhoff’s team is in the process of installing six seismometers on top of Hekla. Each of these metal cylinders contains a mass made from a thermally stable metal alloy. This is kept virtually motionless by means of an electronic feedback loop. Tremors in the ground cause the housing to vibrate, while the mass does not follow the motion due to its inertia. The position of the mass relative to the housing is measured and the feedback loop executes a magnetic or electrostatic counterforce, depending on the model. The voltage required to generate this force is the measurement value that is digitally recorded. This makes it possible to detect movements of just a few nanometres (1 nanometre = 1 millionth of a millimetre). As Hekla offers so little warning time, it is not possible to save the measurement values in the seismometer and take readings on site every few months as usual. Instead, they must be communicated immediately. This usually occurs via 3G mobile modems, but is not possible here for all six seismometers as the modem requires up to five watts of electrical current. 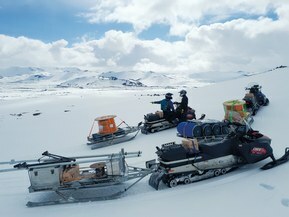 In the gloomy Icelandic landscape, where the sun only rises for a few hours a day if at all in winter, solar cells cannot provide enough energy. That is why Möllhoff’s team decided to use a cable from LAPP to transfer the data. This cable transfers data and also the energy required to run the seismometers, which is generated by three independent small wind turbines. Each wind turbine is supported by a solar cell to compensate for periods of low wind in summer. The aim was to keep overall energy consumption as low as possible, however. The cable was supplied by Johan Rönning, the market leader for electrical equipment in Iceland. Johan Rönning imports and sells LAPP products in Iceland, and supplies electrical components to most geophysical installations. The company has been working with LAPP since 1985. “We are very happy with the cooperation”, says Óskar Gústavsson, key account manager at Johan Rönning. Gústavsson praises the excellent support from LAPP’s experienced experts: “They’re also fantastic with delivery times”. The distances between the wind turbines, data transfer centres and the seismometers are relatively short. In many sectors, LAPP is known for not having minimum order quantities. This allowed the scientists to order the three kilometres of cable they needed for their entire installation. But the main argument in favour of the LAPP cable was its robustness. The hard volcanic stone makes it impossible to install a cable underground, meaning it has to be rolled out over razor-sharp rocks. Here it has to withstand mechanical abrasion and sub-zero temperatures in the Icelandic winter. Snowfall can also occur all year round. Another important factor is heat. Here, above the thin crust of the Mid-Atlantic Ridge, the rock can be very warm. Geophysicists have already measured temperatures of 50 degrees Celsius at a depth of just half a metre. Furthermore, highly corrosive gases flow out of the ground at some places. On the positive side, this inhospitable landscape is not home to any voracious animals that could gnaw away at the cable. The job of selecting the right cable fell to Bergur Bergsson. 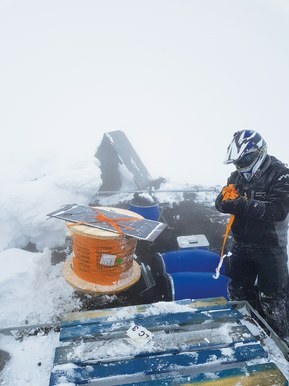 The engineer from Iceland’s meteorological office went looking for a Vaseline-filled Ethernet cable with four twisted-pair cores, screening and a robust outer sheath. 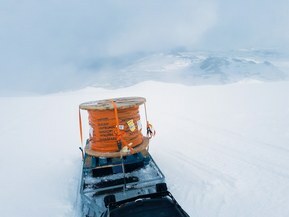 Bergsson’s colleagues have been using these cables in seismic measurement networks for 15 years, such as in a similar project on Vatnajökull, Iceland’s largest glacier. The decision to choose LAPP was above all thanks to the company’s good website and search function. “We were able to find exactly what we were looking for”, says Bergsson. “LAPP is also a very trustworthy brand in the cable sector”. On the LAPP website, Bergsson found an outdoor cable for connections in telecommunication. The cable features four twisted pairs, surrounded by an aluminium-coated plastic band that acts as screening. The PE outer sheath resists UV light and is transversely waterproof, meaning that it does not allow moisture to penetrate through the sheath. If water penetrates at the ends of the cable, in this case at the connections to the seismometer and the modem in the data centre, or through a tear caused by a sharp object, the water is prevented from spreading through the cable. This is because the cable is filled with petroleum jelly, commonly known as Vaseline. Möllhoff thinks the choice of cable is a very good one. The 60-volt direct current power supply to the seismometers is stable, as is the data transmission in both directions via separate wire pairs. This allows the volcanologists to adjust the seismometer settings from afar. 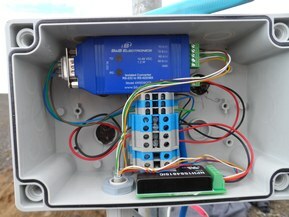 The measuring system for the first installed seismometer works perfectly, collecting 1.5 gigabytes of data per month and transmitting it live to Reykjavík and Dublin. So far, there is nothing to suggest that Hekla might be about to erupt. The measurement campaign is planned to continue until the next eruption occurs. The goal is to discover how imminent eruptions are reflected in the measurement data and to provide insights into developing a permanent early warning system. Such a system could then also be installed on other volcanoes At any rate, the research goes on. Martin Möllhoff: “There are still plenty of volcanoes we have not explored yet, and plenty of unanswered questions”.